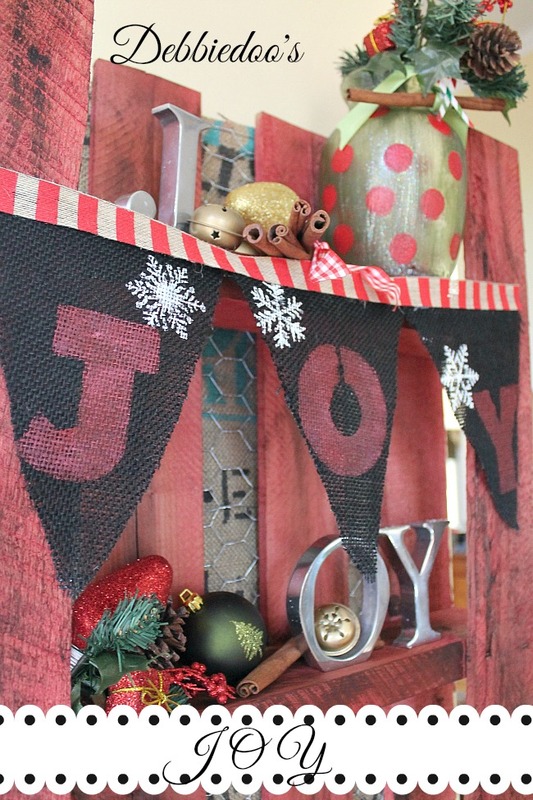 Today I am sharing a mini JOY mini burlap banner. 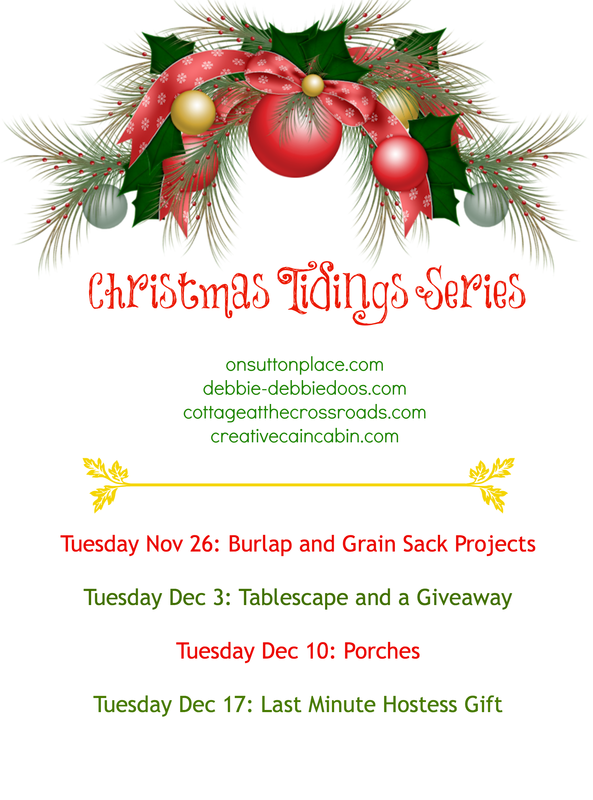 So happy once again to be part of our Christmas tidings mini series with the gals. I love to make burlap banners and this one was a breeze. I had some black burlap left over after I made my Peace, Love Joy Pottery barn inspired pillow. I usually use every last piece of burlap I have left on some sort of project or craft. cut burlap in triangle shape. I actually worked off a my original burlap family room banner I did last year. I dabbed some snowflakes using my snowflake stencil I bought from the dollar tree. I then stenciled JOY on each banner, used a ribbon to go across and there I have a mini Joy Banner. I am actually ahead this year on our Christmas decorating, which feels pretty good for a change. I decorated my Free diy rustic pallet with things I already had for years now. J O Y letters came from Target years ago. 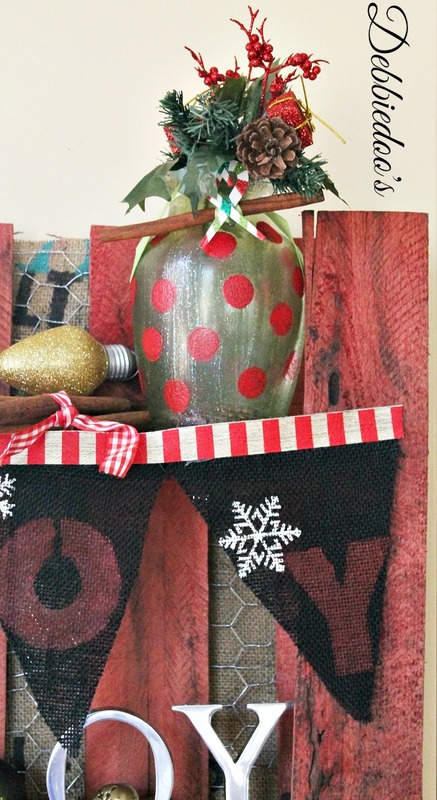 My sparkly mod podge Christmas vase found a home too of course. I think that about covered my burlap banner project. Easy peasy as always! And to kick off the season, we have a lovely giveaway for you all. Our generous sponsor of our giveaway is Holly who makes and sells handmade wooden signs with decorative vinyl lettering on her website Well of Words. Holly sells personalized signs for wedding and anniversary gifts, baby gifts, and all kinds of decorative signs and vinyl lettering for the home. 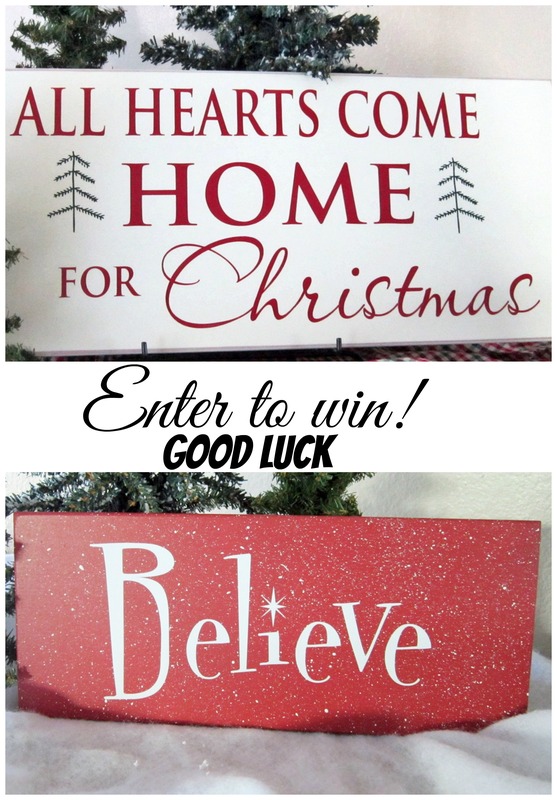 She has donated two of her beautiful holiday signs to give to two lucky winners. One of them is this handmade Believe sign which would brighten up any wall or table display for the holidays! This 6 x 13 inch sign is hand painted a cheery Christmas red with white vinyl lettering and flecks of snow! And this All Hearts Come Home for Christmas is also handmade and painted off white with red and green vinyl lettering. 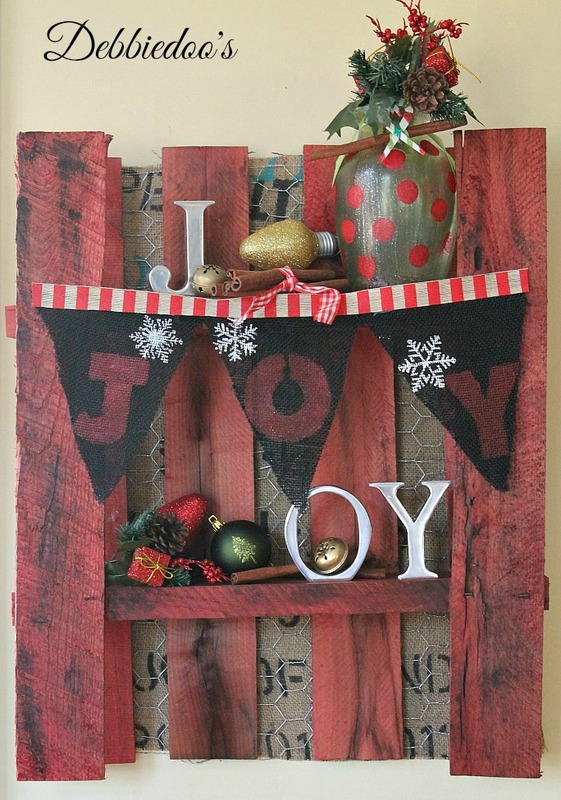 This beauty would definitely add a bit of Christmas country charm to any home. Hope to inspire and please pop on over to the other gals and see what fabulous burlap craft they came up with. Follow me around too if you like! 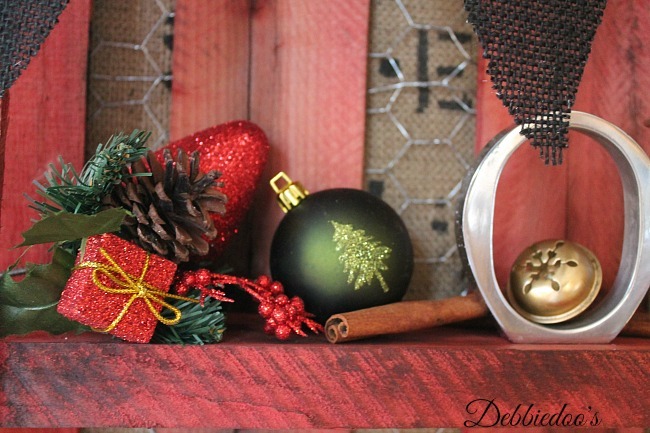 Very creative Debbie, I am ahead of the Christmas decorating this year too, in fact I am done, just finished today. It is such a good feeling. Loving your project, you are a stencil queen. 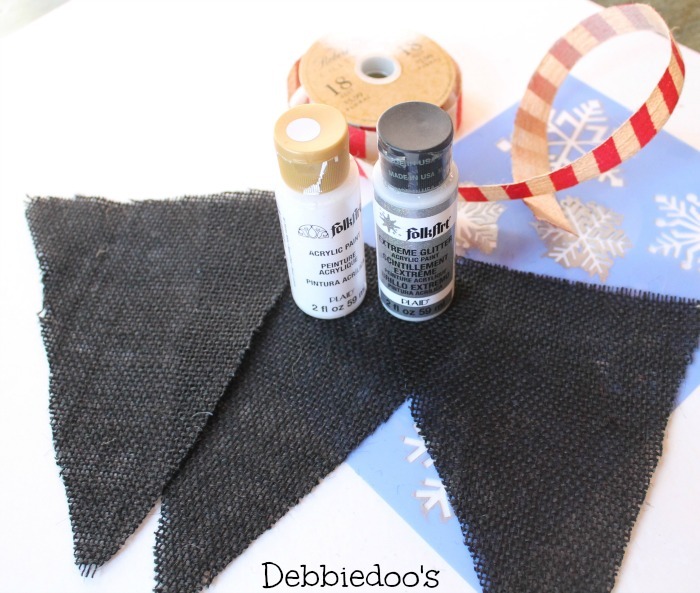 Your banner is adorable…and I love the black burlap! I wish I was ahead with my decorating…hopefully I will catch up with you soon! Debbie, your banner is as cute as can be! At first I wondered why you had only the letters O and Y displayed, and then I saw it up there on the top shelf! LOL! I am in the middle of my decorating and it is all a mess right now. Hope I can get if finished soon so I can have that good feeling that you have! What a fun holiday craft! I’m so excited to start decorating! Happy Thanksgiving to you and your sweet family! Hugs! I not only love the little banner, but I love the whole presentation. I still have a pallet sitting in my garage waiting for me to actually do something with it. I have been planning to make it fabulous ever since you did that one of yours. Amazing how projects just refuse to do themselves, huh? Love your mini banner, Debbie! I love that snowflake stencil. Now I really need to get to the dollar store! I’m a new visitor to your site, popped over from Creative Cabin. 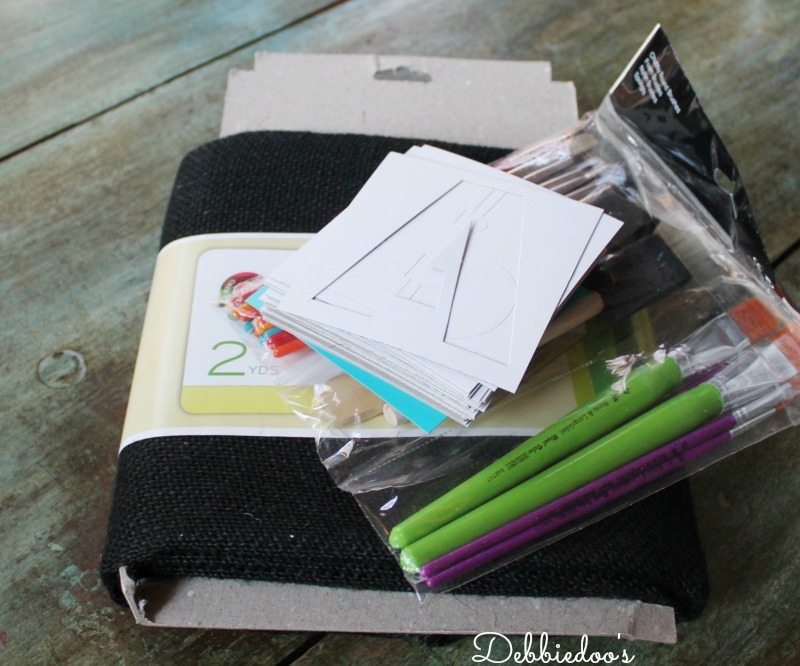 Love this little project, thanks for sharing. Such a cute idea!! Your decor is adorable. I haven’t done one single thing…just don’t have the spirit this year. I keep trying so perhaps something will change in the coming days. Hope you’re having an awesome week with your family!